Set amidst the breathtaking beauty of the Canadian Rocky Mountains in the majestic wilderness of Banff National Park, Post Hotel & Spa is a model of understated elegance. Canada’s largest ski area is just minutes away and the abundance of snow is just one reason a growing number of skiers visit the area each winter. 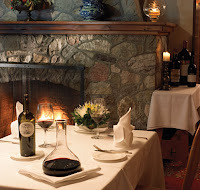 An award winning wine list and fresh market cuisine are featured in the renowned dining room. Post Hotel & Spa features guestrooms with mountain views, overlook trees and cabins, and the hotel’s well-manicured lawns. Post Hotel & Spa offers renowned fine dining and an award winning wine cellar featuring 30,500 bottles and more than 2000 selections. The Post Hotel is a Four Diamond award winner and Distinguished Restaurants of North America receipts. Among a setting of character rich Canadian pine and close to the warm glow of the grand fieldstone fireplace, you will savor the talents of the Post's international cooking team. Unwind and indulge at Temple Mountain Spa. The spa is inspired by and nestled in nature, and designed to envelop you in comfort. The newly revitalized Roman-inspired pool is perfect for a peaceful float or a few energy reviving laps.